The structure of proteins that protect telomeres (shelterin proteins, from "protective shield") are promising targets to combat cancer, but to date, there has been no effective form for attacking them. In the absence of drugs that destroy telomeres, cancer retains one of its most terrible properties, which is the ability of its cells to divide perpetually. Two years ago, a research group led by Maria A. Blasco at the Spanish National Cancer Research Centre (CNIO) hit upon several compounds that caused injury to these protective chromosome structures and now, in a study published in Nature Communications, they show that these drugs achieve this effect by acting on PI3K, a key protein in cancer and ageing. This is the first time that a functional link has been described between this pathway and the telomeres. For years the Telomeres and Telomerase Group has been investigating pathways to attack telomeres as a form of blocking cancer cell division and causing their death. In a study published in 2015, they described a new strategy to achieve this objective after telomerase inhibitors had failed; telomerase is an enzyme that is necessary for lengthening telomeres, but its inhibition does not have immediate effects on the destruction of telomeres. "The idea was to look for drugs that were able to reduce levels of TRF1, one of the essential shelterin proteins for the integrity of telomeres," said Blasco. "We found several that, when administered, caused damage in these structures, and this led to the cancer cells not being able to divide, but we did not know what their precise target was." In this study, Blasco, together with Paula Martínez and Marinela Méndez-Pertuz (first authors in the paper), proposed the hypothesis that the reduction of TRF1 was due to the action of PI3K, since the compounds developed at CNIO belong to a previously identified series, namely PI3K inhibitors. This molecule forms part of a key pathway in ageing (the first to be identified), described by Cynthia Kenyon thanks to her studies with C. elegans. Likewise, PI3K is one of the most mutated proteins in cancer. Upon administration of these chemical compounds, the investigators observed that TRF1 levels were reduced and, in addition, the action of PI3K was inhibited, but they did not know if there was a connection or what it could be. This is where another component of the PI3K pathway called AKT comes into play. Under normal conditions, one of the functions of PI3K is to modify AKT, activating it by phosphorylation. However, this reaction does not occur in the presence of PI3K inhibitors. "We then studied whether AKT modified TRF1 in any way and we saw, through different experiments, that this was indeed the case," said Blasco. 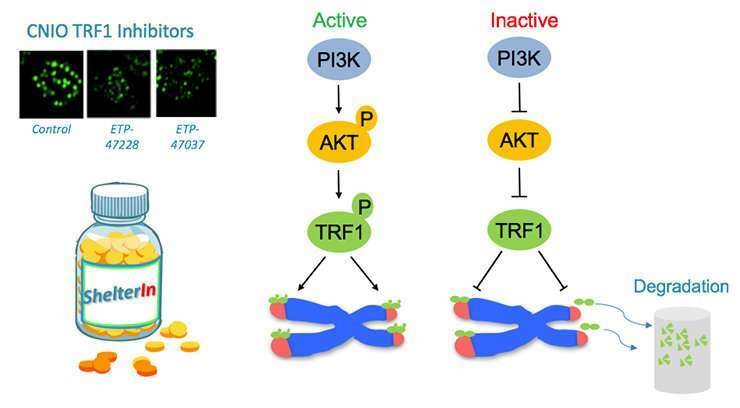 "AKT also modified TRF1 by phosphorylation." 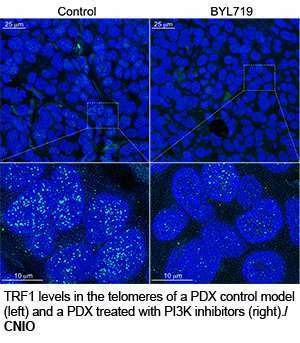 By blocking PI3K, these phosphorylation reactions were blocked and TRF1 lost stability, its half-life was shortened, and it bound less to the telomere, which was left unprotected. This finding could have implications in the management of tumours that present PI3K mutations and that are being treated with PI3K inhibitors. In Avatar or PDX mice, Blasco and collaborators determined that the response to treatment with PI3K inhibitors is related to the reduction in the levels of TRF1. In light of these results, it seems that the antitumour activity of PI3K inhibitors depends on their action on TRF1. Therefore, there is reason to believe that those patients who develop resistance to these drugs could benefit from treatment with other TRF1 inhibitors. This is the next step.